clickthing: Does it count if it's free? aha! i was wondering how a typist could blog. now i see how. very cool. 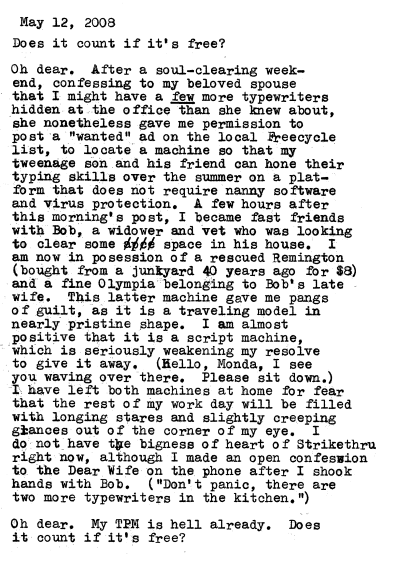 those typewritten letters are giving me huge pangs of nostalgia. the newsroom i work in has a couple of old typewriters from days long gone...a normal-sized body and keyboard, and an extra-long platen; i'm not entirely sure why. All the cool kids are typecasting: you should, too. Perhaps someone in the newsroom is nostalgic, or just being practical. We still have a typewriter on-hand for the occasional form or carbon that needs to be completed (think certified mail) but it's a wimpy little electric with a plastic daisywheel for type. I prefer the hulking steel behemoths and their svelte portable cousins for going fully "unplugged." What is your TTC (total typewriter count)? Depressing, that's what it is. A. Script. Olympia. You're too casual about these things. That machine alone deserves a Penalty TTC of +2 just for not checking the font earlier. If it's baby blue or pink, +4. Even if your wife has it. Monda, it's white, so I hope that brings me back down a bit. After doing some searching around, I think it's an Olympia SF -- they seem to be particularly poor about labeling the models, for some reason. I wasn't trying to be casual about it, more like trying to not shake uncontrollably when I'd realized my luck. Olympia seems to have several italic and script faces in that era, so I wasn't sure until I ran a piece of paper through it and checked the (faded) letterforms. It's a find for sure.